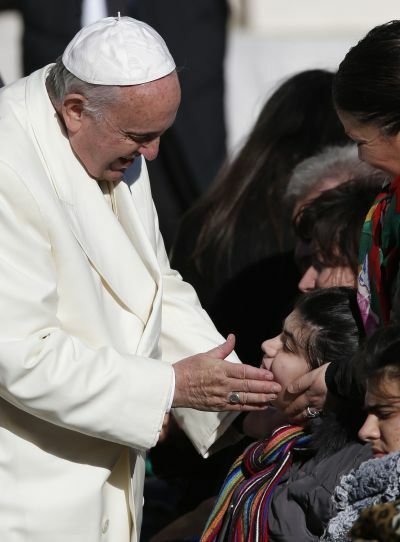 VATICAN CITY (CNS) — With the strength of the grace that comes from the sacrament of marriage, Catholic families are called to proclaim God’s love to the world, Pope Francis said. God’s love gives birth to the family, and that love must be “the center of all its human and spiritual dynamism,” the pope wrote in a letter Dec. 9 to Archbishop Vincenzo Paglia, president of the Pontifical Council for the Family, which will sponsor the Sept. 22-27 World Meeting of Families in Philadelphia next year. The October extraordinary Synod of Bishops on the family, and the general assembly of bishops scheduled to meet in 2015, are attempting to identify the most urgent needs of families today and to devise pastoral responses to them, he said. “The challenges of these contexts stimulate us to enlarge the spaces of faithful love open to life, to communion, mercy and solidarity,” the pope said.